Evolphin has seen first hand every challenge faced by today’s media producers, having worked closely with companies that have dozens of geographically-dispersed team members creating hundreds of videos per day, as well as smaller organizations working in Adobe CC files with thousands of layers. Zoom 7.0 leverages these experiences to bring content creators a media asset management solution with cloud and on-premises deployment models. With unprecedented user customization capabilities, Zoom 7.0 extends the boundaries of content production. What separates Zoom 7.0 from other solutions is the broad array of business issues and challenges that it addresses. 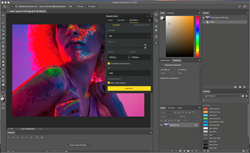 To accomplish this, Zoom 7.0 integrates tightly with Adobe CC, so teams can manage production workflow from within their creative application of choice, saving them hours each day. Version tracking and comments are visible to team members working from any location. Ingest content directly from Adobe Plugins, allowing for efficient file syncing as well as improved version tracking and role based access security. Zoom 7.0 is also capable of handling data stored outside its repository as though they were inside it, preventing file versions from getting lost and enabling best-in-class search functionality. As part of its revamped user interface, Zoom 7.0 features a new Asset Browser. What users first notice about the Asset Browser is the Activity feed, a Twitter-like interface that automatically informs the user of all activity associated with their content. But what has producers most excited is the Asset Browser’s customizability, which lets users personalize their workflow based on what they’re working on and their individual creative process. Coupled with the ability to search the Zoom repository within Adobe, hover scrub, and drag assets directly from the Zoom panel to the Timeline, Zoom 7.0 is poised to change how content creators work. Video is projected to claim more than 80% of all web traffic by 2019. It is with this reality in mind that Evolphin built Zoom 7.0. Zoom 7.0 enables a production and post-production environment that lets creatives stay within their native Adobe Premiere Pro application so that they can find, create, edit, review, approve, save, and distribute media and videos. With Zoom, creators can manage their workflow from within a single application window. The Zoom 7.0 plugins for the Adobe suite further refine what our users know and love, with sync, search, and new export capabilities that are more tailored to each specific Adobe CC application. Adding assets to your project from the Zoom MAM only takes a few clicks to find and insert. Comments are pushed live to your application, so you can view, reply, and take action without ever having to leave your Adobe app. In each application, users can now choose from a variety of presets for export formats that are tailored to the application you are using. For instance, when exporting in InDesign, choose multi-page exporting, and specify output from a variety of PDF presets. Extract metadata from 1000s of layers in Photoshop within seconds, and export using render presets and modules, and whether to use the work area or full comp length in After Effects. Evolphin Zoom 7.0 is a new solution to address a new set of challenges. We enjoyed building it; we hope you enjoy using it! To learn more about all that Evolphin Zoom 7.0 has to offer, contact us to request a demo today: http://www.evolphin.com. Evolphin Software is an Enterprise Software company focused on Media Production and Collaboration with a global footprint and a suite of products delivering a unique and highly functional approach to the creation, management and distribution of digital content. For more information about Evolphin including pricing, email info(at)evolphin(dot)com or call 1 (888) 386-4114.